Immigration Minister Peter Dutton last week announced that a group of somewhere between 100 to 400 refugees, currently living in Australia, would be cut off from government support. Members of the group had come to Australia from Manus Island or Nauru for medical treatment or other emergency situations, and more than 50 of the group are children who have been born in Australia. The Minister claims that these people no longer have any cause to be in Australia, and has changed their visa status to a 'final departure bridging e-visa'. The effect of the pronouncement is that these people will have no weekly payments, and will lose their accommodation. While children under 18 will still be able to attend school, those over 18 will not. As these people have so far been forbidden to work in Australia, they cannot rely on jobs to support themselves. They literally have no option but to rely on charity. Dutton alleges that these refugees have been 'scamming' the taxpayer, 'taking us for a ride', and implies that they are living lives of luxury. He has alleged that the asylum seekers are getting 'a better deal than pensioners' and constitute a significant economic burden on Australia. In fact, the cost of supporting these people in the Australian community is significantly less than the $5 billion cost of housing asylum seekers offshore since 2012. According to government reports, it costs $40,000 per year to support an asylum seeker in the community, but over $500,000 per year to incarcerate them on Manus Island or Nauru. Further, demonstrating an astonishing lack of understanding of our legal system, the Minister has called lawyers who act for asylum seekers 'un-Australian'. His charge is that lawyers have been using 'tricky tactics' to keep asylum seekers in Australia. He claims that in doing so, lawyers have led these people astray, causing them to have hope that they might remain here. In fact, says Dutton, these people have never been entitled to stay in Australia. Dutton has indicated that there are constitutional limitations to removing the refugees through legislation and that consequently, the government has had to fight these matters through the courts. He finds it 'incredibly frustrating' that law firms are prosecuting their 'social justice pro bono agenda' — as though there is something wrong with the notion of fighting for justice for the vulnerable. Dutton's comments have been condemned by lawyers' organisations, who point out that it is central to the work of lawyers to assist their clients to pursue their rights at law. "It is the role of the lawyer to assist those affected to enforce their rights and to test the validity of the minister's decision. If we do not do this, we are more likely to see the growth of power, fearless and unconstrained by the law." The importance of holding power to account cannot be overstated. To the general public, there are many so-called 'technicalities' in the law that are likely to seem simply burdensome or wasteful. However, it is important to see law and legal process as part of a larger system. Our system contains myriad checks and balances that together seek to protect the powerless from arbitrary exercise of power. In recognition of the enormous power wielded by a government minister, such as Dutton, the law constrains the exercise of that power. In our system, it is therefore open to those who are affected by a minister's decision to hold the decision-maker to account. It is the role of the lawyer to assist those affected to enforce their rights and to test the validity of the minister's decision. If we do not do this, we are more likely to see the growth of power, fearless and unconstrained by the law. I don't subscribe to the un/Australian dichotomy, but I do see the Minister's accusation as a perversion of the term. By contrast, removing support for vulnerable people with little notice — whatever their technical legal status — can truly be said to represent our worst side as a society. When this action is taken by an agent of the State, we know that there are only two remaining lines of defence. One is the lawyer to prosecute any possible legal avenue for protection. The other is you and me. Now is the time to step up to help these people. If you can, support your local church, refugee organisation, or the Human Rights Law Centre. I didn't realise that the defunded refugees are not allowed to work. That is a disgrace and totally unreasonable!! How do we get rid of unwanted extremist Queenslanders? Perhaps its the sun or something in the water? ...nor educate themselves nor increase their vocational skills, Paul. Just vegetate... or, preferably, rot. Such is the morality not only of Dutton but of the whole Cabinet that endorse this approach. Thank you to the lawyers who have worked so long and so hard to support these refugees. 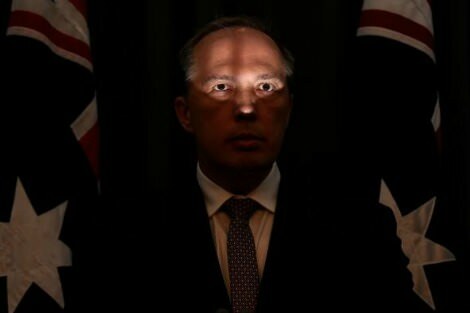 I read somewhere yesterday that it is possible that Peter Dutton might become our Prime Minister. A Prime Minister who either does not understand our system of governance, with separation of powers, or else who chooses to defy it. Either way it is a terrible prospect. We seem to live in two different worlds. On the one hand we have politicians jumping through hoops to prove that they do not have dual citizenship despite being born in another country. Don't the children of refugees born in Australia have a claim to citizenship and protection under the law? Thank you Kate for saying what so many of us think. Various governments' treatment of asylum seekers and refugees in recent history has been so appalling that I am ashamed to call myself Australian. The UNHCR has deemed these 400 people to be legitimate refugees. They have not scammed anyone. Rather, we have imprisoned them in appalling conditions on Manus and Naura where their mental health has deteriorated to the extent that they feel that they have no hope and take their own lives. The women and children are raped and abused in many other ways. What a scam! Where do I sign up? And now the Australian Government has decided to condemn these people, whose only crime is to be refugees, to lives of uncertainty, homelessness and starvation. Again! Where do I sign up for this amazing scam? All power to the lawyers who are trying to help them! Lawyers are truly the last line of defence. The irony is that the government is chock full of lawyers who are using their skills to withhold justice and destroy the rule of law. The intended postal plebiscite is profoundly undemocratic. It will be conducted by the Australian Bureau of Statistics, in the hope that it will be considered a 'gathering of statistics', not an electoral matter requiring oversight by the Australian Electoral Commission and an appropriation of funds by the parliament. The federal government is circumventing the will of the parliament. This is part of a broader trend to attack, undermine, defund, and erode the democratic institutions we rely on. Being both gay and Catholic leads to a somewhat fraught existence. On one hand, we have our Catholic peers who, frequently, have trouble empathising with what it means to be 'intrinsically disordered'. On the other, we have our queer friends who are, understandably, sceptical of our allegiance to an organisation that has a deep history of discrimination towards people like us. This existence is further complicated for those of us who choose to partake in ministry that sees us employed by the Church.